Members of Coombe Hill Golf Club are blessed to play on one of only a handful of courses designed by J.F. “Aber” Abercromby. It’s said that the master architect spent a great many hours, not only walking the land, but also floating over the site in a hot air balloon, honing his design. In 1911, three years after completing Worplesdon and three years before Addington, Abercromby’s course at Coombe Hill opened for play with the Right Honourable Winston Churchill among the early club members. The quartet of par threes (two on each half) is a particular highlight, with only the final one-shot hole, the heavily bunkered 147-yard 17th, measuring less than 150 yards. The 6th is the opening par three, where club choice is paramount depending on where the pin is cut on the two-tiered green. The 9th, affectionately known as “little gem”, measures 185 yards from the tips and it’s one of the best and most attractive one-shot holes in Surrey. A pretty valley separates the tee from the plateau green, which is not only ringed by four bunkers, but also slopes wickedly from left to right. Marking a three on the card here is no easy feat, even for the accomplished player. The 188-yard 12th is a favourite of many and another delightful one-shotter where you should take a bow if you find sanctuary on the smallest green at Coombe Hill, which has a severe fall away on the left hand side. 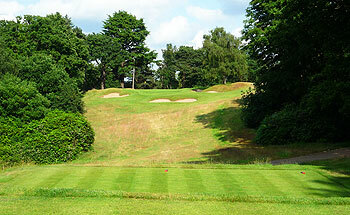 Coombe Hill is routed in two returning nine-hole loops and measures 6,401 yards from the back tees with par set at 71. Back-to-back par fives appear at holes 4 and 5, so build your score going out as there is only a solitary par five coming home. The undulating terrain and exciting elevation changes make for thrilling golf, but if you find yourself on the wrong side of pin, especially above the hole, you will do very well to avoid three putting on Coombe Hill’s notoriously tricky greens. Course Layout: First, this has some of the most beautiful and challenging par 4s. Although the 9th hole could be characterized as Coombe Hill’s signature hole, the other par 3s are just as lovely. A handful of folks will not fully appreciate the course given its handful of relatively short par 4s. What makes these shorter par 4s is that it often take a very well placed tee shot to take advantage as the undulation of the greens and firmness make precise shots very important. Course Location: Proximity to London adds to the rating here. At only 6-7 miles from Central London, Coombe Hill serves as an oasis. Condition: Some of the nicest, quickest, and fastest greens around. The course is always well maintained. Difficulty: Although short, missed shots will be severely punished. Firm and fast greens make high GIR a must as scrambling is likely to result in a score above par. Historical Importance: Eisenhower lived on this course during WW2 while planning D-Day. There is a large crater in front of the 10th tee from a Luftwaffe bomb intended for General Eisenhower. I spent a perfect Spring day at Coombe Hill in April 2018 (coincidentally, the warmest April day in London in 70 years) - and can honestly say it was one of the most pleasant experiences of my golfing life. This course may lack the one-through-eighteen "teeth" to be considered a true championship test, but if offers a wonderful variety of old-school holes and design values, not to mention perfect conditioning. Similar to classic Abercromby layouts at The Addington and Knole Park, there is a lot of uphill and downhill shot variety at Coombe Hill, as well as at least one blind tee shot. Not every modern golfer seems to favor this type of quirkiness, but these features are a welcome and integral part of the Coombe Hill experience. Do yourself a favor and play a round at this classic course! There is no doubt that, as soon as you enter the clubhouse at Coombe Hill GC, you get a sense the quality and attention to detail that’s ahead of you. The clever use of space throughout the venue is noticeable in every department, from clubhouse, to practice areas, to the course itself. There have been significant improvements since I came here 4 years previous, mainly cosmetically, as the new groundsman has a vast and efficient team, who ensure the highest greenkeeping standards are maintained rigorously. Although the course is restricted by its boundaries, the challenge isn’t compromised, with the most fearsome defence of the course being the undulating, electrifying greens. Despite many holes looking like a drive and a flick on the scorecard, especially by modern standards, the course has an ample amount of trees and thick rough, so keeping the ball on the fairway is more beneficial than a length advantage, to score here - particularly as you’ll need to control your approach shots into the slick surfaces. The lie of the land and design of the holes offer a variety of challenges, as you are faced with numerous elevation changes, which require good judgement and shot selection to land and hold the ball on the greens. Standout shots include the tee shot on the par three 12th and the drive on the par-5 15th, which invites a soft fade from an elevated tee. The only obvious weak point of this layout is the blind approach to 18, so remember to take a look at the green and the pin before you head out! For me, this is a really interesting and enjoyable golf course. A round here gives plenty of opportunities to choose different shot types from tee to green and regularly challenges your short game. Coombe Hill is a thrilling JF Abercromby design that compares well with many, if not most, of the famed nearby Surrey and Berkshire courses that occupy the various top 100 golf course lists. In fact to the untrained eye you would be forgiven for thinking you are playing one of the great heathlands at this flamboyant woodland venue. The routing of the course is particularly appealing as you make your way through hundreds of English Oak trees, vibrant rhododendrons (at least at this time of year), small patches of heather and various other natural species that adorn this beautiful piece of land. Indeed, apart from the hum of the A3 whilst playing a few holes towards the low end of the estate it is a sea of tranquillity. Considering it is locked in by residential housing (multi-million pound pads to be more precise) you are more likely to be disturbed by a squirrel clambering up a tree or a bird tweeting on your backswing than by anything else. After a lovely introduction, with a couple of descending yet tricky two-shotters, you play your way up, round and down this golfing playground and teasingly see glimpses of future holes. It’s a fine place to golf. The brilliant putting surfaces are the main defence of this 6,401 yard, par 71 course. There are a number of tantalising green sites too; the third, eighth, 11th and 14th are four that I will pick out as my favourites. But it is the internal contours of the large greens that really impressed me with the many slopes and borrows to consider when putting. At times you must be conscious of where you place the flagstick after removing it from the hole… just in case! There are so many good holes at Coombe Hill and the eighth is one of those that simply screams of excellence… The set of short holes is simply wonderful too and just goes to show how this can be accomplished without too much length. The longest is just 188 yards from the stones, two others are within half a dozen paces of that and the shortest a tad under 150, but three of the four play to different points on the compass so there is plenty of variety in actual playing length if there is any sort of a breeze. In truth, there is very little to be negative about at Coombe Hill. I was lucky enough to play Coombe Hill earlier this year and what an absolute pleasure it was. Even the drive up to the club is truly exciting - you come off the busy A3 and find an oasis! The staff were extremely welcoming and were always one step ahead of our needs. The course itself is testing, albeit not particularly long, which makes for a great challenge! The greens were in fantastic shape across the whole course and offered an extra challenge as they undulate a lot. The clubhouse is also a great place to enjoy a beer after the round. A truly wonderful experience! An outstanding golf course so close to the centre of London. The whole experience was enjoyable; service, facilities, course and staff. There are some special holes and we had sunshine to top off the experience! The greens were in great shape too which just added to the fun. I was lucky enough to play Coombe Hill at a corporate day and have to say, that for a central London course, this is a real gem. Although not overly long, it’s a challenge to both first time players and members (we had a member in our group who although playing off 6, struggled all day). It’s laid out around a hill, creating many varieties of hole that all demand thought and careful approach play. However, it’s the greens that make this course the challenge. There are possibly 3 easyish greens on the entire course – the par 4 8th was probably the most dispiriting! A long par 4 up a hill, I hit the green with what I thought was a great 4 iron. When I reached the green, I found myself 5 foot above the hole. Three putts later, I was still faced with a 5 footer! A true gem of a course, with a lovely clubhouse and staff and only 20 minutes from central London.